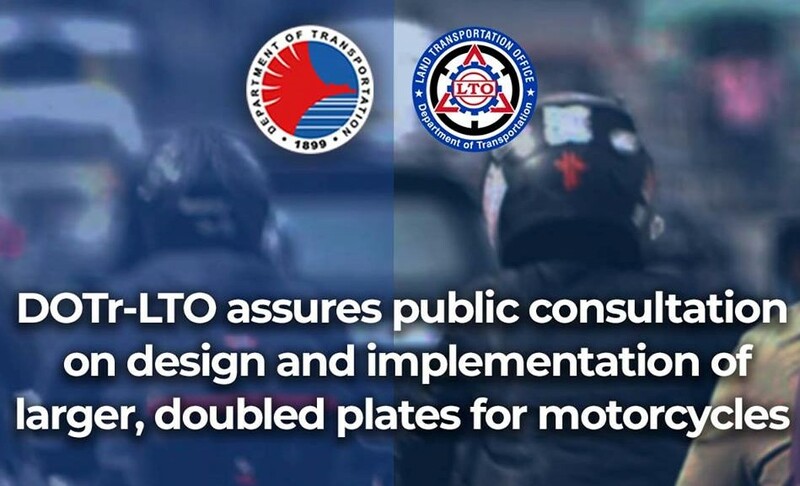 The Department of Transportation (DOTr) and the Land Transportation Office (LTO) recently clarified that they will hold consultations on the design and implementation of larger and doubled plates for motorcycles with concerned sectors. To address the motorists concern on the larger and double number plate requirement on the Republic Act No. 11235 or the “Motorcycle Crime Prevention Act,” DOTr Secretary Arthur Tugade said that transportation agencies will be conducting public consultations with motorcycle manufacturers and riders. “Magkakaroon ng consultation sa motorcycle riders. Pakikinggan natin ang mga suhestyon para mapaigting ang safety and security. Sa pagpapatupad ng bagong batas na ito, hangarin natin ang kaligtasan ng rider, ng sakay niya, gayundin ang seguridad ng publiko na siyang sentro ng batas na ito,” said Tugade. During the Transport Talks press briefing, LTO Assistant Secretary Edgar Galvante mentioned that there will be a minimal increased rate in the registration fee for the larger plates. He also presented sample plate designs and emphasized that the LTO is also open to suggestions on materials and design of the new plates. “Wala pong provision sa batas na nagsasabing metal plates ang gagamitin. Materials should be sturdy enough to have a plate that is readable. Welcome po ang DOTr at LTO para tanggapin ang inyong mga suhestyon,” Asec. Galvante said. Aside from proposed plate designs, LTO is also considering the conduction stickers and decals with RFID.